Symptom: close objects appear clearly, but distant objects appear blurred. 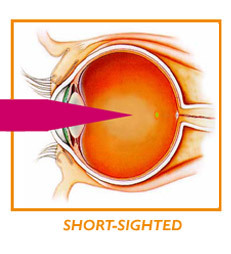 Cause: the eyeball is longer than normal and/or the cornea is too “bulging”. So, rays of light are brought to a focus in front of the retina. 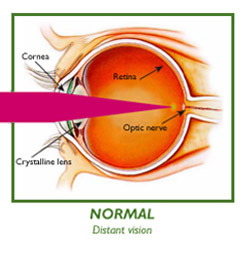 Myopia usually appears during childhood or adolescence, and becomes stable when the patient is a young adult. Treatment: myopia is corrected by wearing diverging glasses or contact lenses. The same optical effect can be obtained by reshaping the central cornea with Excimer laser.